Warning: The blog you are about to read is X-rated No, make that an R rating. Well, let’s say PG-14. 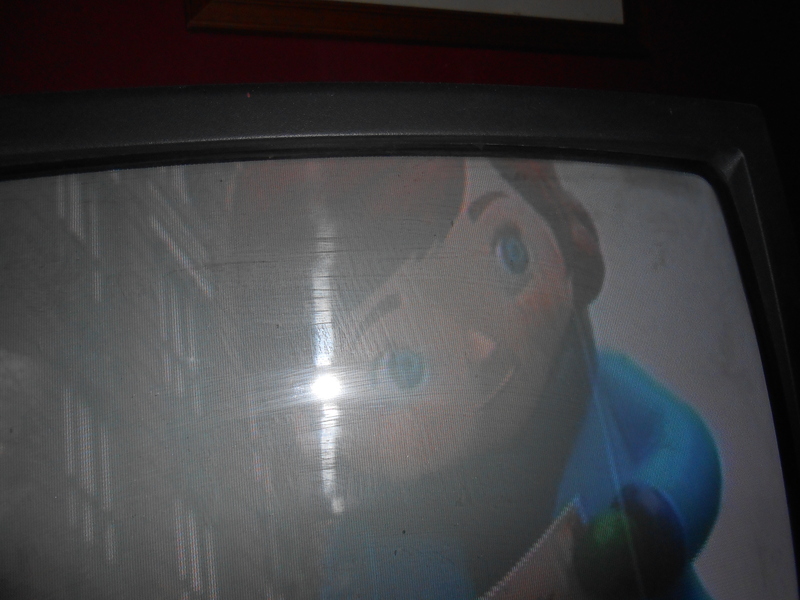 At any rate, it’s about my losing my …….. No, not that. What’s the right word? My ideals? My expectations? My innocence? For once I’m at a loss for words, so let’s just get on with it. 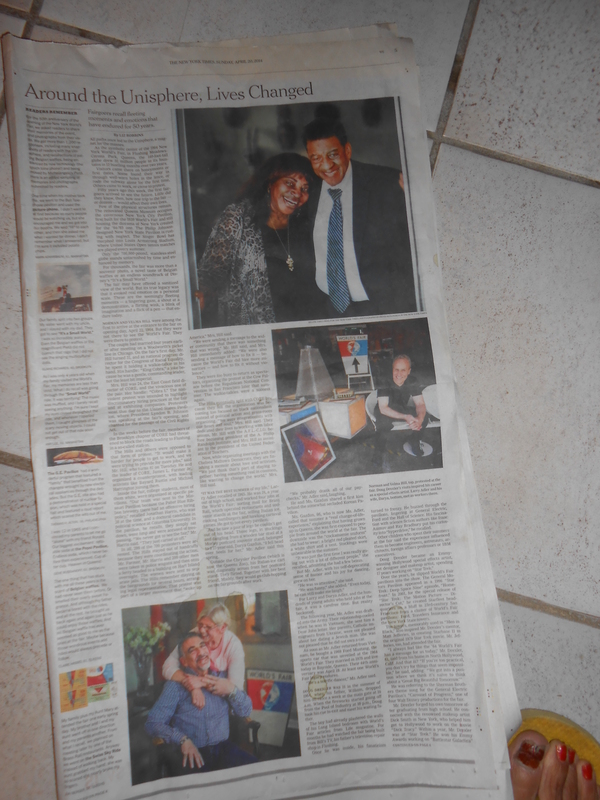 I’ve been meaning to write about this day since I came upon this feature article in the New York Times last Spring. 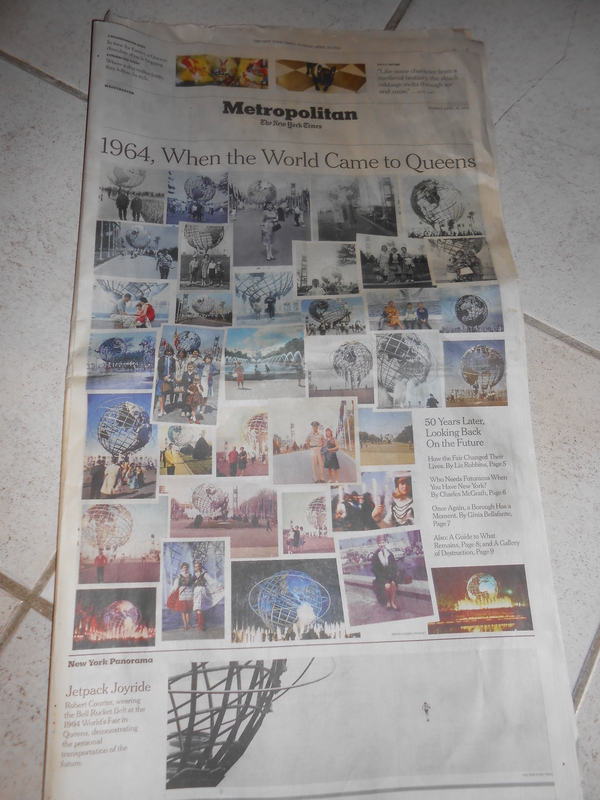 It was marking the 50th anniversary of the 1964 World’s Fair at Flushing Meadows Park in Queens. There were personal accounts of people who’d had their lives changed by attending. As for the Fair, itself, I have only boring memories. I remember the lines being terribly long, and we just couldn’t be bothered standing and waiting. (As if we had better things to do?) 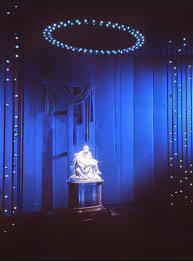 We did stand on line to see Michelangelo’s The Pieta, and it was truly breath-taking, bathed in blue light. Oh yes, we did consider one line worth joining – a log jam ride. 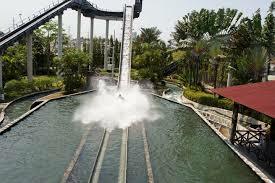 I rode in front and saw the splashdown coming, so did everyone else except Susan who was wedged in at the rear, and didn’t see it coming. Did I mention teased hair and lots of eye make? 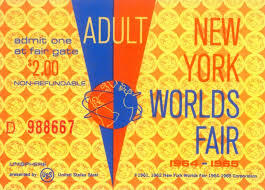 So no, the world’s fair was not exciting and did not live up to my expectations. I probably wouldn’t have given it a second thought upon reading the commemorative article, had it not been for the trip there. As I said we were left to our own devices to get there so of course I went with, as kids would say today, my four homies. Grace, Tina, and I were coming from different ends of Manhattan, and Suzanne from the Bronx, so we met at the Time Square subway station. Susan’s family had recently moved to Queens so we were to meet her at the Queens Plaza subway station. But when we got there, she was nowhere to be found. As it turned out she was waiting at Queensborough Plaza – where we were supposed to be. I’m not sure how we figured this out. No cell phones back then so we couldn’t call her. Although we’d never heard of either plaza, we learned that Queens Plaza was, and I guess still is, a hub where different subway lines come and go. Somehow we figured out what train to take next. So there we were – from left to right – me, Suzanne, Tina, & Gracie, standing shoulder-to-shoulder on the platform. We felt the rumble and saw the lights of the approaching train still in the distance, far down the tunnel. We still weren’t 100 percent certain so we decided to confirm that this was indeed our train. A business-type (banker?) man was standing next to me. I still remember he had on a pinstripe suit. “Is this the train to take to Queensborough Plaza?” I asked. I related his answer to everyone – still shoulder-to shoulder. ( Can I take back my earlier comment about us being street-smart? We decided to wait for the next train.) As this train rumbled in, however, another noise distracted me – the rattle of a newspaper, a newspaper he held in front of his fly. I looked from the corner of my eye and saw his fly was open, and he was beating his front and muttering in its direction. Well, maybe I wasn’t street-smart but I was a cool New Yorker. I wordlessly scooted behind my friends to stand at the far end of our formation – leaving poor Suzanne, dare I say, in the line of fire. Only when I was safely positioned, did I lean forward and point. Well, I won’t get graphic, but let’s say he finished the act – just as the doors of the soon-to-depart train began to close. Somehow, four screaming girls managed to wedge themselves in, still shoulder to shoulder, still screaming. And when we’d calmed down – you know what bothered us most? Not that he’d done what he did, but that we’d picked him to ask because he was wearing a business suit. Who’d expect a business man in a pinstripe suit to be a pervert? If your name is Virginia, you’ll know exactly what I’m talking about when I say it’s about to start again. As for the rest of you, if you don’t know the story of Virginia O’Hanlon and the letter she wrote to the New York Sun, back in 1897, asking if there was such a thing as Santa Claus, and the answer she received back, you are blessed…….. and most likely not named Virginia. Yes, fellow Virginias, since 1897 we have been subjected to some wise guy, apropos of nothing, assuring us that “Yes, Virginia, there is a Santa Clause.” And it’s about to spread like the flu. 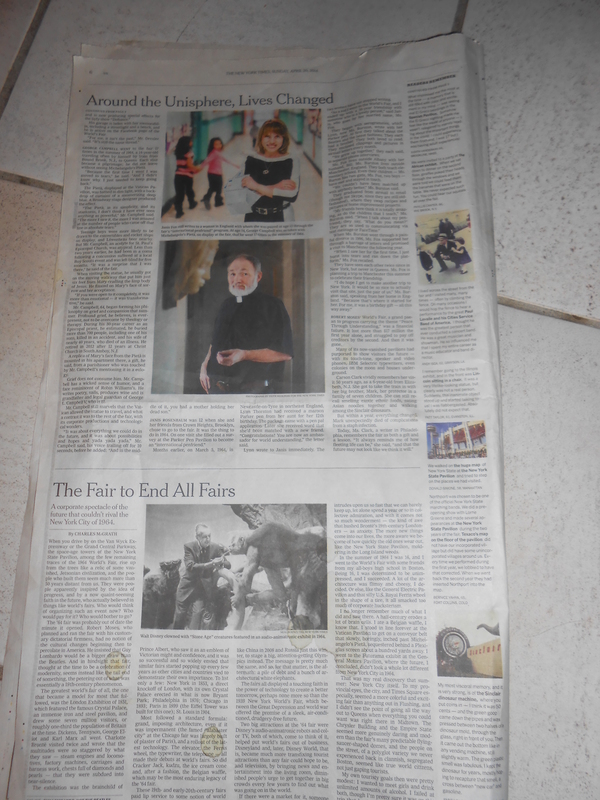 Look what I found in the New York Times last week. 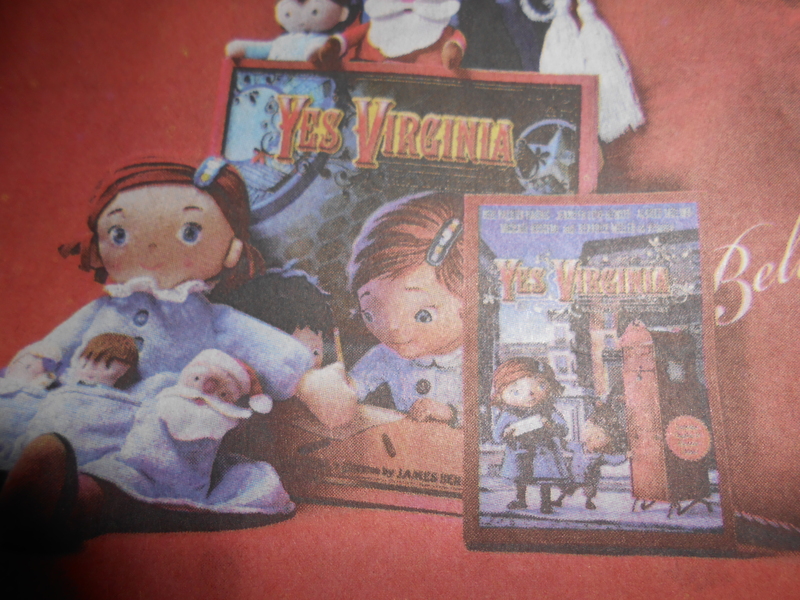 As if Yes Virginia, there is a Santa Claus hasn’t plagued three generations, now they’ve gone and written a book and a DVD so it will spread the curse to yet another generation, all the young and upcoming Virginias. That “Virginia” now has her own balloon. Maybe we should all move to Virginia. 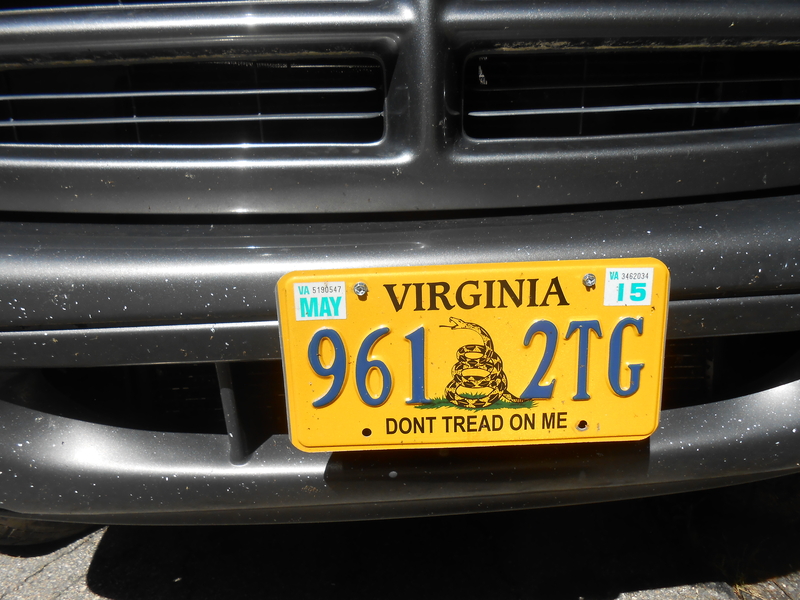 Then when we’re accosted by one of those a $$#@%es, all we’ll have to do is point to our license plates.